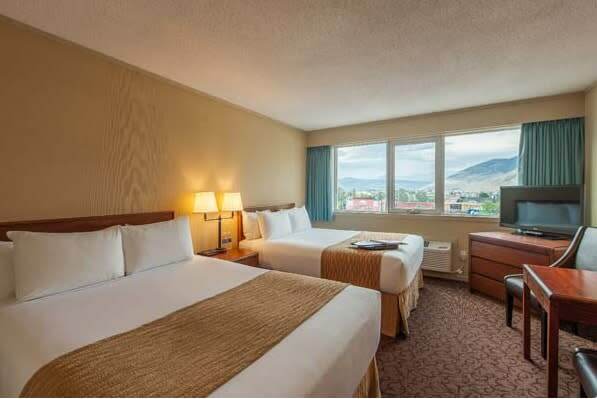 The Thompson Hotel is centrally located in downtown Kamloops, close to shopping, restaurants, business district, and sports facilities. We host distinctive travellers who come to visit the many parks, experience a concert, discover Kamloops' history, taking in various sporting events and discover the city's finest while enjoying our professional and welcoming manner. Amenities include indoor pool, hot tub, fitness room, games room, meeting rooms, amphitheatre room, Sunrise Breakfast Room and complimentary WiFi and business centre. Enjoy a quiet night in our guest rooms featuring a super comfy bed and pillows, triple-paned windows, mini-fridge and coffee/tea service.